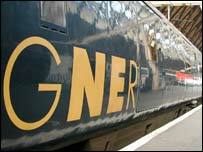 Passengers can no longer smoke on GNER trains as a ban has been introduced. The train operator announced in June that it was to withdraw smoking compartments in response to feedback from its customers. It said research showed more than 90% of its passengers do not smoke and that most wanted smoking on trains to end. The company said customer complaints had risen by 172% over the past two years and it followed similar bans by other public transport operators. GNER has been running a communications campaign, including posters and announcements on trains, to make passengers aware of the changes. When the ban was announced, GNER chief operating officer Jonathan Metcalfe said: "Up until now we have tried hard to accommodate the diminishing number of people who wish to smoke whilst travelling with us. "But it is now very clear that the majority of our passengers are in favour of a total ban on smoking on our trains. The Rail Passenger Committee's East Coast Passengers Panel said it welcomed the move. Simon Clark, director of smokers' lobby group Forest, said the move was not unexpected. He said it was a shame because GNER was the last train company with smoking compartments and that they had seemed a good compromise. The company runs services on the East Coast Main Line between London Kings Cross, the East Midlands, Yorkshire and Humberside, the North East of England and Scotland.